Restrictions: The area is closed to the use of aircraft for hunting moose, including the transportation of moose hunters, their hunting gear, or parts of moose from July 1 through September 14 and from January 1 through March 31, except as provided under terms of a drawing hunt permit in the area outside of that portion of Unit 26(A) bounded by a line beginning at 153° 30' W. long. on the game management boundary between Units 24 and 26(A), north along 153° 30' W. long. to 69° N. lat., east along 69° N. lat. to 152° 10' W. long., south along 152° 10' W. long. to 68° 30' N. lat., east along 68° 30' N. lat. to 150° 40' W. long., south along 150° 40' W. long. 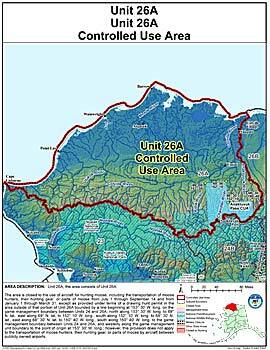 to the game management boundary between Units 24 and 26(A), and westerly along the game management unit boundary to the point of origin at 153° 30' W. long. ; however, this provision does not apply to the transportation of moose hunters, their hunting gear, or parts of moose by aircraft between publicly owned airports.